“Classical Many-Particle Systems with Unique Disordered Ground States” is published in Physical Review E.
Classical ground states (global energy-minimizing configurations) of many-particle systems are typically unique crystalline structures, implying zero enumeration entropy of distinct patterns (aside from trivial symmetry operations). By contrast, the few previously known disordered classical ground states of many-particle systems are all high-entropy (highly degenerate) states. Here we show computationally that our recently proposed “perfect glass” many-particle model [Sci. Rep. 6, 36963 (2016)] possesses disordered classical ground states with a zero entropy: a highly counterintuitive situation . 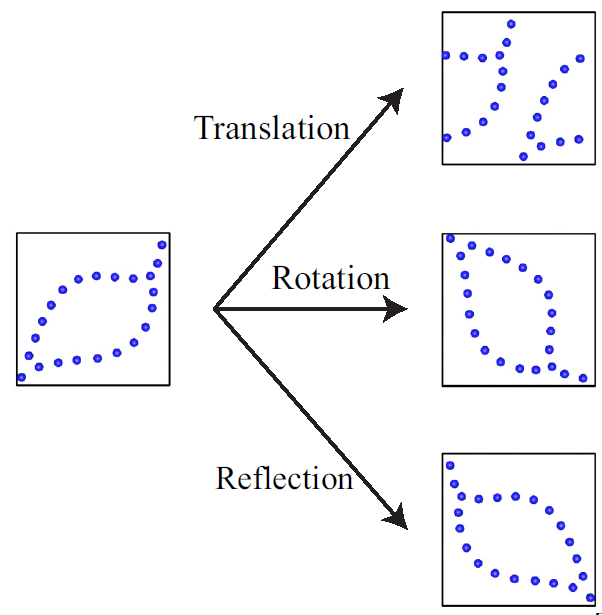 For all of the system sizes, parameters, and space dimensions that we have numerically investigated, the disordered ground states are unique such that they can always be superposed onto each other or their mirror image. At low energies, the density of states obtained from simulations matches those calculated from the harmonic approximation near a single ground state, further confirming ground-state uniqueness. Our discovery provides singular examples in which entropy and disorder are at odds with one another. The zero-entropy ground states provide a unique perspective on the celebrated Kauzmann-entropy crisis in which the extrapolated entropy of a supercooled liquid drops below that of the crystal. We expect that our disordered unique patterns to be of value in fields beyond glass physics, including applications in cryptography as pseudorandom functions with tunable computational complexity.